Happy St. Patrick’s Day, everyone! Did you know that it’s almost a sin in Ireland to refer to a “Patrick” as “Patty”? “Patty” is short for “Patricia”… you’re likely to get your block knocked off if you called a Patrick “Patty”. “Patrick” is English for Padraig, or Paddy for short. Hence, the proper term is St. Paddy’s, NOT St. Patty’s. Okay, enough of the English (Irish?) lesson… let’s talk about what we’re eating today instead of bacon. 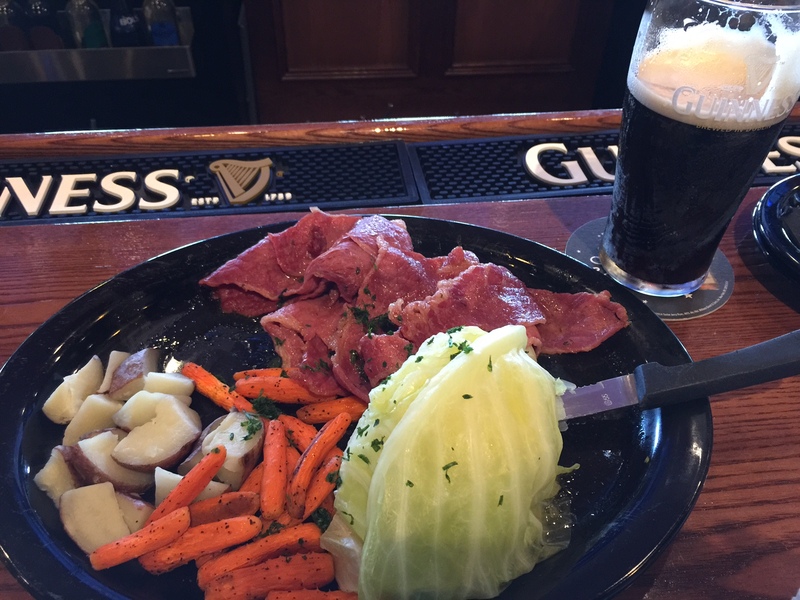 Well, St. Paddy’s Day might be my favorite day during Lent as far as food is concerned, because I get to eat corned beef & cabbage all day long! Today, I traveled all over southern Palm Beach County trying salt-cured (or corned) beef. First, I met Steve at Tilted Kilt. If you’ve never heard of this chain restaurant, it’s been described as “Hooters with a Scottish twist” – scantily-clad female serves in short kilts. But I was there for the food. When Steve suggested the Tilted Kilt, I replied, “But they’re Scottish….” But upon looking at their website, they claimed that they were “in the tradition of Scottish, Irish, & English pubs”, and that the Boca Raton location we were visiting was holding their Grand Opening party that day, so I went. Their corned beef & cabbage platter was good enough to start the day, but I found the corned beef cut too thinly and it could have been more tender. Next on the agenda was Dubliner. They are known for a huge St. Patrick’s Day block party every year – probably the official party of the City of Boca Raton. 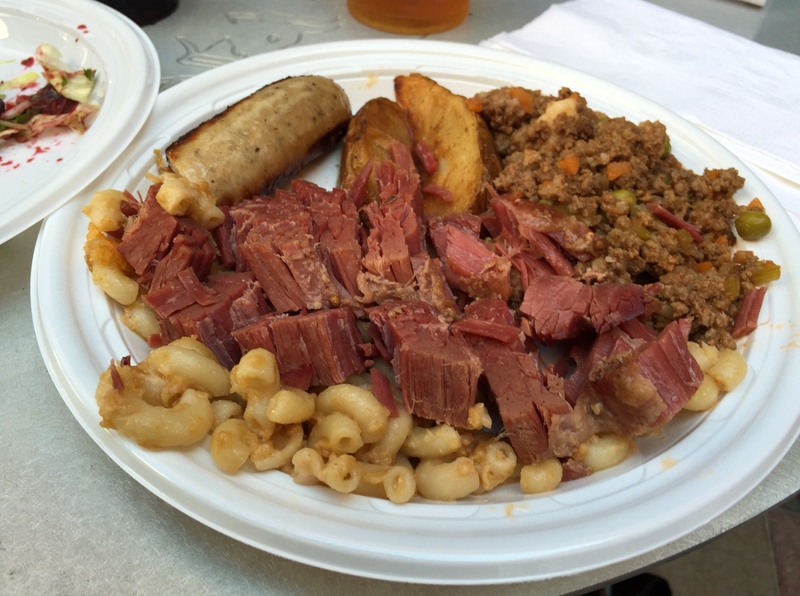 They have a buffet every year of salad, Guinness mac ‘n’ cheese, corned beef & cabbage, shepherds pie, and bangers & fries. If you notice, their corned beef is much thicker and moister – cooked for hours – and falls apart when spooned onto the plate. And the Guinness-based shepherd’s pie and mac ‘n’ cheese are to die for. Outstanding. Finally, I went to home and grabbed Susan and we went downstairs to Banana Boat for their St. Paddy’s celebrations. 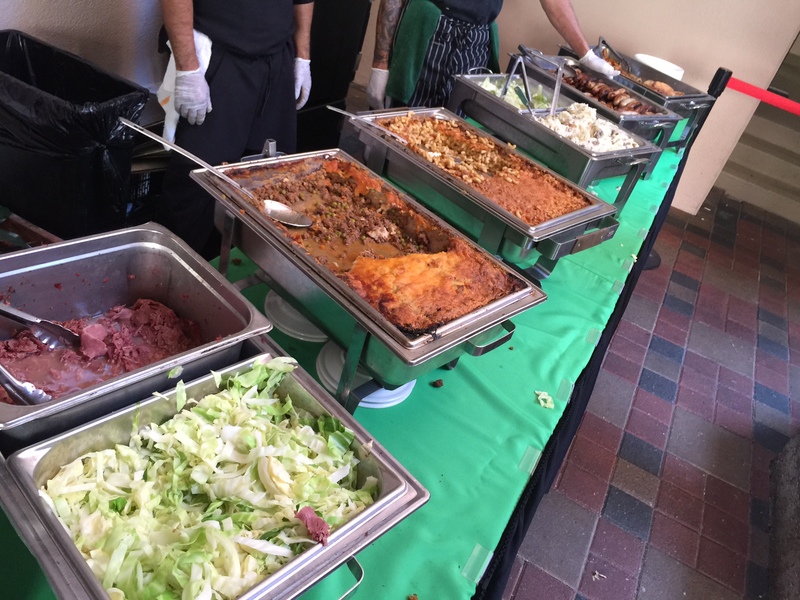 It’s not an Irish pub, but they’re always festive and serve food to match the occasion. 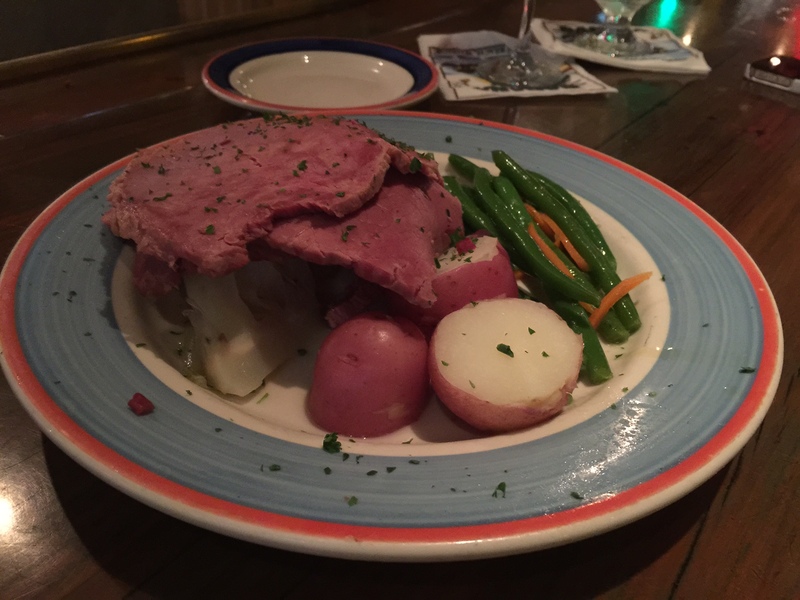 Their corned beef was tender and cut thick – they always seem to do a pretty decent job with the food there. All in all, it was a great day of food, Guinness, Jameson, Irish music, and green everywhere. And if you can’t have cured pig, why not some salt-cured (corned) beef?? Hump Day. Wingsday Wednesday. Whatever you want to call it, it’s 4 days ’til Easter, which means 4 days until bacon. 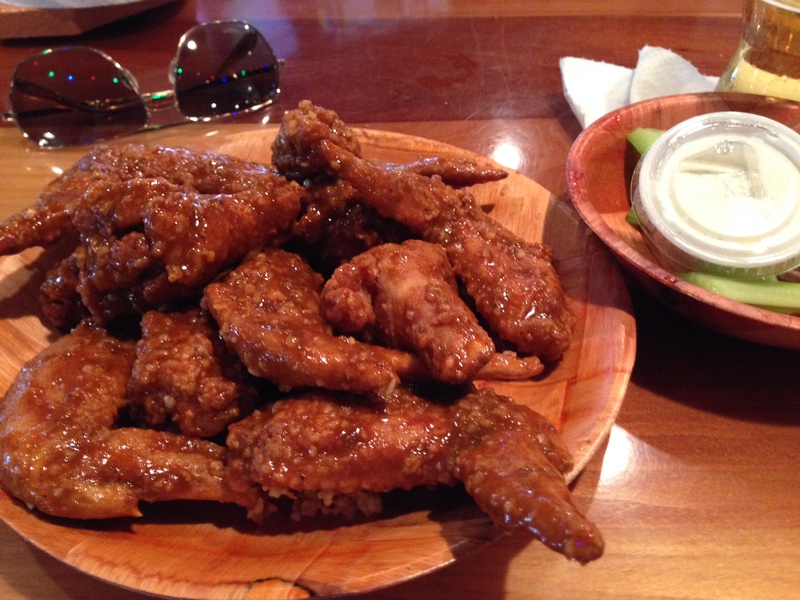 To get through hump day, we went to our go-to Wednesday lunch spot – Hooters – for wings and a beer… or four. 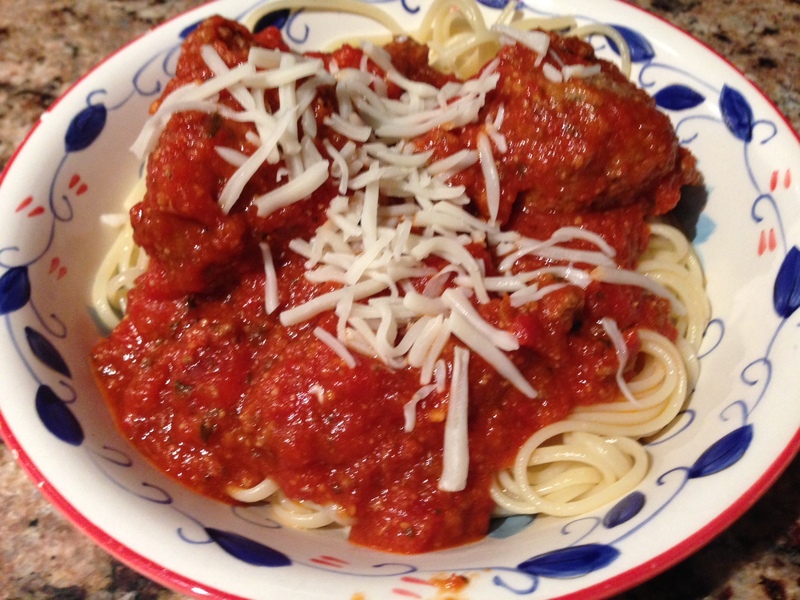 After wings for lunch, Susan broke out some delicious bolognese sauce and hearty meatballs that she picked up at a deli she discovered over the weekend. Toss on some mozzarella, and mangia! Although there was no bacon in the meatballs, they were great nonetheless… and only 4 days to go ’til some savory meat candy! It’s Wednesday, y’all! I actually never use the word “y’all”, but I’m in a goofy mood and I thought it would sound funny, especially coming from me. I guess I get in a goofy mood on “hump day”, because it means it’s our weekly trip to Hooters to see our girl Amanda behind the bar. But instead of the buffalo shrimp Rob and I normally get, we went straight to the wings. 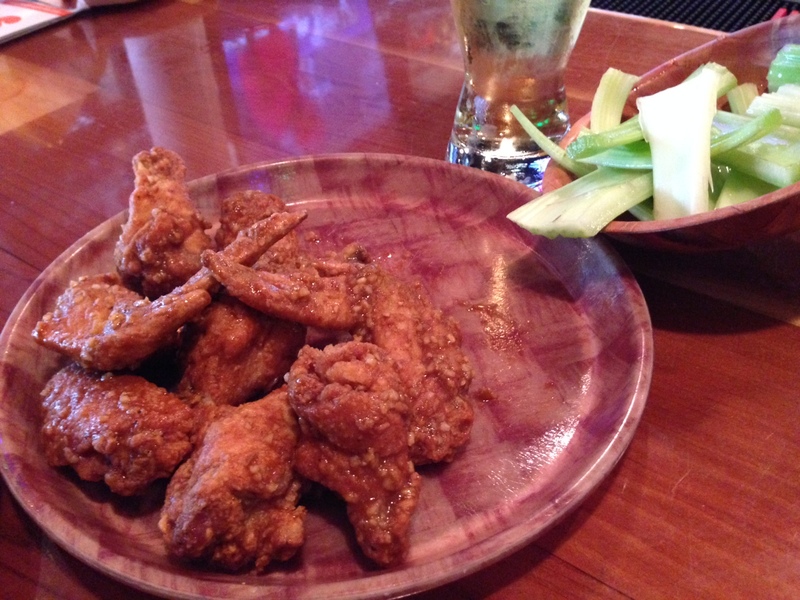 Today, we did their “9-1-1” sauce – the hottest Hooters makes – because we wanted to start our lunch off with a kick. After that, I kinda wanted more wings, but Rob decided to switch it up. 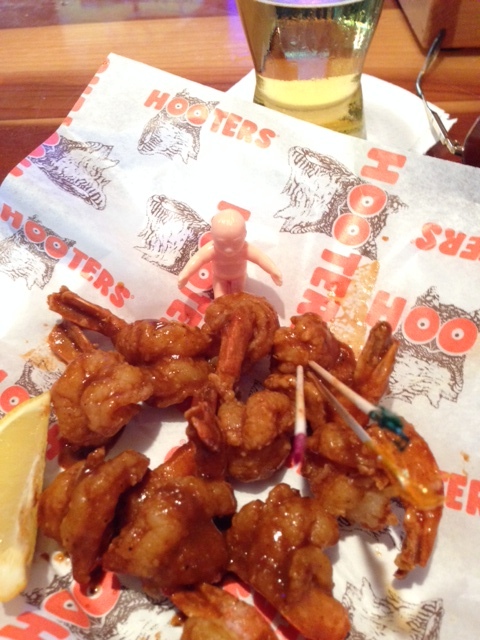 Since we were both still hungry, Amanda suggested something filling – the Hooters Lots-a-Tots®. 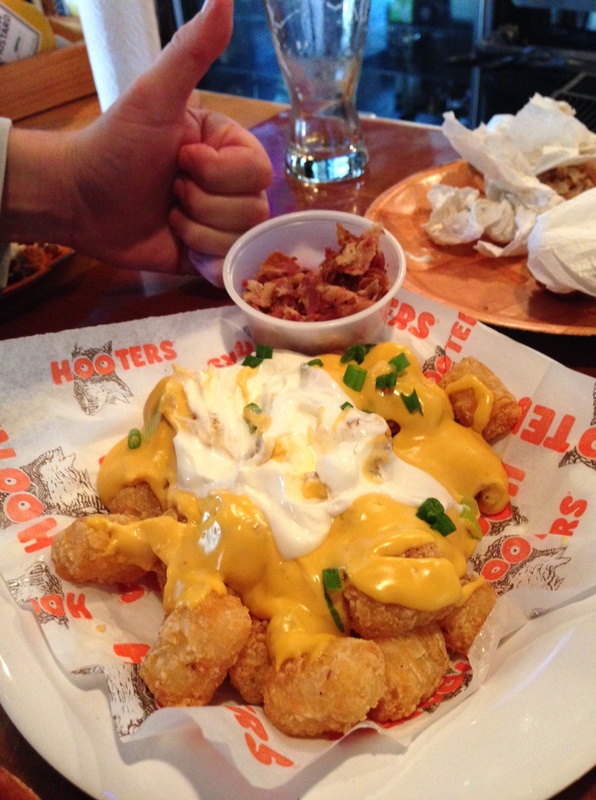 This addictive appetizer – I mean “Hooterstizer” – are crispy, crunchy tater tots topped with bacon, cheese, sour cream, and chives. Because of Lent, I had them put the bacon on the side. Trust me… their Lots-a-Tots® are much better with the bacon. Much better. Ah, hump day. How am I going to get over the hump without the salty, sweet taste of bacon today? Just like I did last Friday – with trusty ol’ breakfast sausages. In fact, I had such a big breakfast today that I didn’t leave room for my weekly visit to Rob’s and my usual Wednesday lunch spot. So instead of ordering a plate of “9-1-1” breaded wings after our appetizer, I just stuck to “9-1-1” buffalo shrimp. So after an important lunch meeting at Hooters, I headed into the office for an hour before my next important lunch meeting at Salt7. Wednesday they have their “Tsunami Menu” – a bunch of sushi rolls for $3.50 and under. For that price and the view, you can’t beat it! Well, with two successful business meetings and a few glasses of wine under my belt, I popped into Off the AVE for a couple slices of pizza and a Philly cheesesteak to bring home to the missus. Not a bad hump day after all – maybe this week isn’t turning out to be so bad after all.